A trie is a data structure that makes it easy to search for words or prefixes in a corpus. 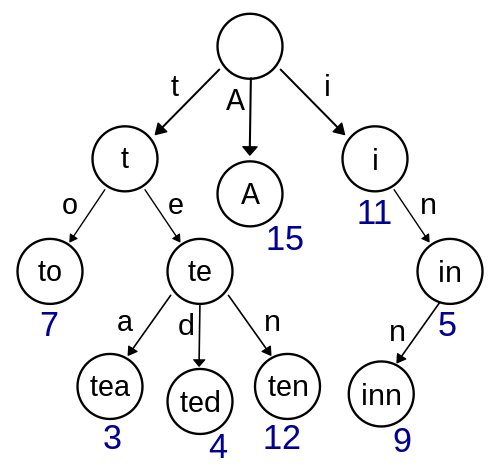 The structure of the trie reduces the complexity of searching for a word or a prefix down from O(n) where n is the number of words in the dictionary to O(m)where m is the length of the query . Pretty sweet, huh? Visualization of a Trie, from wikipedia. So when I ran across a leetcode question which needed a trie, I realized that I’d never actually written one before. Hence this blog post. Before I get into my implementation I want to give a huge shout out to Shubhadeep Roychowdhury who wrote an awesome blog post on the trie structure. I based a lot of my code on his implementation of the trie. for the larger Trie data structure. the Trie to see if a 'word' is `in` the Trie. Add a word to the Trie. Side note, see those type hints?! Apparently in python 3.5 they added them as ways to help indicate the types that are expected (and returned) from functions. Python is still totally dynamically typed, but they serve as hints to the reader. Anyway, the code is pretty self explanatory but if you have any questions please leave them in a comment below. Also, if you use this code note that it is not battle tested, so act accordingly.